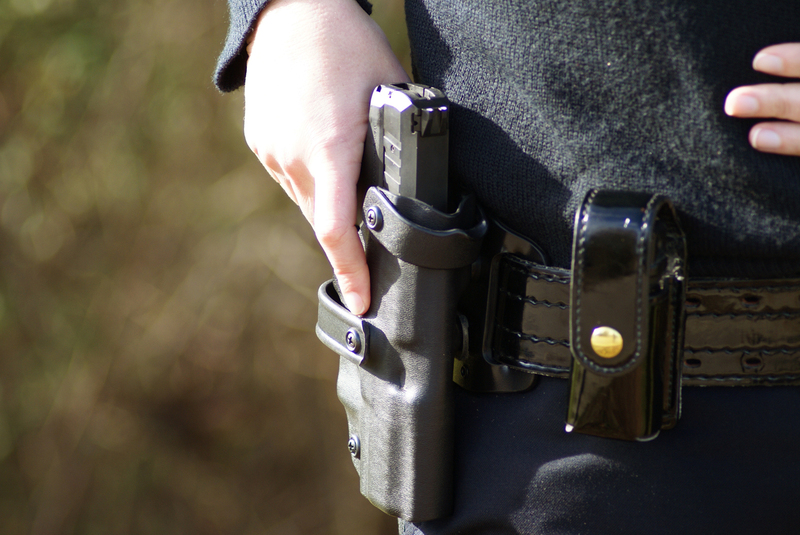 All Level II Custom Duty Holsters are available for both right and left hand shooters. Each holster is made from .093" Kydex/Boltaron and fastened using Melonite & Zinc coated hardened steel hardware. The first level of retention is an adjustable Military Grade Rubber Retention System. This system can be tightened or loosened to the desired holding using a Philips head screwdriver. The second level of retention is our ever reliable Thumb Throw System. This system consists of a rotations hood, held in the upwards position by a molded detent. To draw the firearm, one must manually overcome the detent. The third level of retention is an ejection port locking system, which requires the grip-located snap release button to be broken and the firearm rocked forward to be drawn out. There are no buttons or springs waiting to fall out, or possibly cause a negligent discharge. All holsters are covered under a Lifetime Warranty and Satisfaction Guarantee. For any questions or concerns, please contact us.